Germany There are 6 products. Grenadiers are the mainstay of the victorious German army. 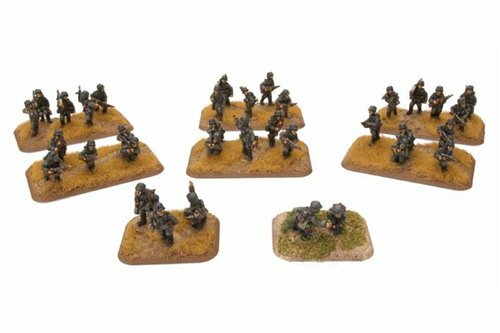 Fighting on foot, these soldiers are well armed and confident in their training ~ Pack contains 2 small bases, 8 medium bases, 1 Officer, 5 NCO, 1 Panzerknacker, 1 50mm Mortar Gunner, 1 50mm Mortar Loader, 4 MG Gunner, 4 MG Loader and 29 Riflemen figures. Panzergrenadier Platoon - Panzergrenadiers spearhead attacks in close cooperation with the Panzers. They are always at the forfront of the Blitzkrieg. - Pack contains 2 small bases, 6 medium bases, 1 Officer, 4 NCO, 1 Panzerknacker, 1 50mm Mortar Gunner, 1 50mm Mortar Loader, 6 MG Gunner, 6 MG Loader and 16 Riflemen figures. Mortar Platoon (8cm or 10.5cm NbW35). Mortar Platoon - German crews are alert and efficient, they can bracket an area with uncanny accuracy and target it to ensure that survival is made...difficult - Pack contains 3 small bases, 4 medium bases, 1 Officer, 1 NCO, 3 Riflemen, 2 Observer, 4 Medium Mortars, 4 Gunner and 8 Loader figures.